Kim... There is no "late" with bloom day... you have quite the list of flowers in bloom and bud. Isn't it an exciting time in the garden? Everyday something new. I'm looking forward to seeing more pictures of your flowers once you get some better light. And thanks for the encouragement on the Deutzia. I do plan to find a place for some new ones, but probably not until fall. You certainly have an eye for wonderful compositions, if that photo of the Japanese maple, purple tulips, and oregano is representative of your garden as a whole. Lovely! Great pics! I'm sensing a kind of "train wreck" in my yard, too...I think it's some of the psycho temperature fluctuations in the midwest this year. Couple days of 80's trick the summer bloomers into emerging, then then the cold slap in the face with low's near freezing. I agree though, exciting and I'll take it! Purple tulips, gorgeous. Was that a red japanese maple I saw in the background? This list sure reflects the name of your blog - color, texture, foliage, size! May sounds pretty spectacular for you. Kim, it's funny to read that you have white echinacea already - mine pouted so long after our dip in temperatures in April that they're only 6 inches high with no buds yet.... see - you guys ARE catching up with Texas! What a nice long list of plants in flower already, even after that nasty cold April you got. And so much to look forward to as well. Love the plant combinations you're making! The pics are not half as bad as you think, but the problem is always that even the best pic doesn't do justice to the true beauty of a garden. That is something we have to see, smell, hear and feel ourselves. Kim, a lot of the photography books say that an overcast day actually makes the color of flowers more saturated. I read a photographing wildflowers book and they regularly use either a translucent umbrella or translucent tent to shade the flowers from the sunlight even in a forest. I seem to prefer a cloudy day rather than a sunny one unless I want the flower/s to be backlighted but usually there's not that much planning in my photo taking and much is left to serendipity. I usually don't care for dark flowers but your 'Black Hero' tulip is certainly handsome. Such a wonderful shade of purple. I didn't even know they had lithium AA batteries! 2 days for the first charge, yikes! What about subsequent charges? like carol said - there is no "late"
you really have quite a lot happening in your garden. impressive. I think your pictures turned out really well. I love the deep-coloured double tulip... there's something about seeing salvia in bloom that I love. As I went through your list of plants, I realised your garden is far ahead of mine. I noticed yesterday that the Baptisia had shot up and is now a grand 5 inches tall. Yours is a garden I love to read about because we have such similar taste -- and yet quite a different approach. From you, I can learn. I will sometimes go looking for things I have read about on your site but am not familiar with, because I just know I could find a ready place for them in my garden. By the way, as I think ki mentioned, the cool, even lighting of an overcast day is (IMHO) second only to morning/evening light for garden photography. No harsh shadows, no washed-out colours. I don't know if you're using Picasa, but it's a free tool that will let you adjust the colour temperature of your digital photograph (which might help you achieve the specific look you are going for). Anyway, don't overlook an overcast day. It really is good light for photography. Wow. Lots going on. 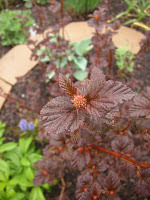 Where do you plant your tiarella? I am afraid that I don't have a moist/shady enough spot for it. I like the purple tulip/golden oregano/red Japanese maple combo! I wonder if the golden oregano would make a good stand-in for yellow creeping jenny in a drier situation? Carol, you're so right about how it seems like every day is something new at this time of the year! Can't wait to see where you find room for the deutzia. 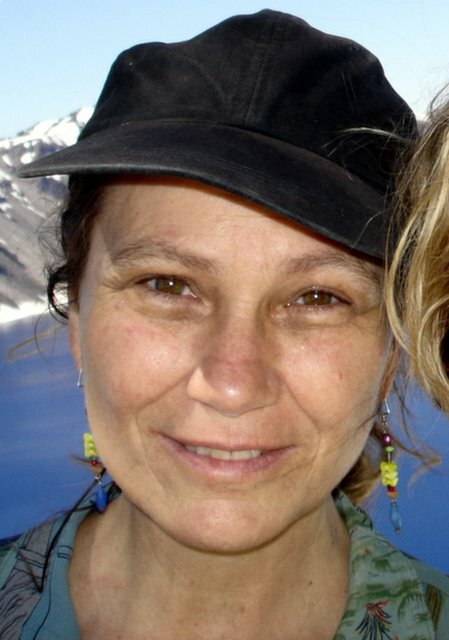 Pam, thank you! I just love that little golden oregano as a part sun/part shade groundcover. It's bright at this time of the year but fades to a lovely chartreuse in summer. ottawa gardener, indeed it is a Japanese maple! That is the only thing that was here when I moved in that remains in the same place. I mulched it and do water it some when it's very dry, and it's starting to really fill out nicely. annie, that we have echinacea in the same stage both amuses and scares me a bit! :) My leaves are only maybe 4 in high, but the flower stalk is about 8in already. Since these were tiny new plants last fall, I am definitely going out there today and cutting down the stalk so it puts it energy elsewhere. ki, that's interesting re: using translucent umbrellas. Maybe I just like the low sun times for photography because I like to view my garden that way, then? Hmm. Oh, re: the batteries, I'm loosely keeping track of how much use I get out of them, and will definitely let you know both that and how long the subsequent charges take! kate, I have similar feelings about the salvias. :) My baptisia is just about 14 inches tall, and not very full yet--they were small when I planted them--but about 3 stalks on each plant have buds on them. Last year I had 2 flowers altogether on 3 plants, so I'm excited! 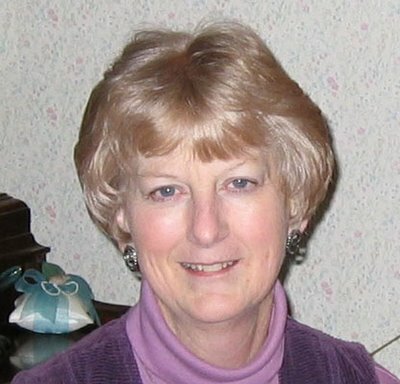 karen, I would love to copy your entire first paragraph and post it right back at you! I have been struck by the same feeling when looking at your blog, but haven't ever stated it so well as you do here. :) And another vote for overcast skies... hmm... maybe I need to reconsider! meresy_g, I confess that I don't have a moist enough spot for it, either, given my sandy soil here. It hasn't gotten nearly as full and big as it normally would, so I cheat and plant it closer together than recommended. And topdress it with lots of compost every spring, and sometimes again in the fall. entangled, I think it would be worth a shot--especially since you can buy small herb pots of golden oregano for just a couple of bucks! This gets just a couple of hours of sun each day, and it does fade to a lovely chartreuse in the summer. (The bright gold color is only in the spring and again in the fall--I'll see if I can post a summer picture for you.) But it's a much more polite spreader than the lysimachia and I never do any supplemental watering, even of the newly replanted chunks when I dig it up and move it around. 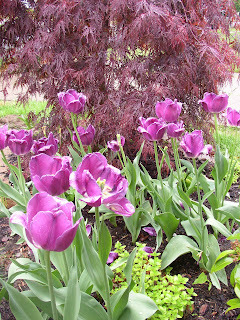 I love your photo of the Japanese maple and the purple tulips! Everything seems to be sort of moving and bouyant, and I like the combination of colors. My garden is a site of great despair-- lots of things died over the winter/crummy spring and those dratted violets have taken over everything again. I'm going to be gone for a month and know it will be an unpretty chaos when I return. It's interesting to read about all that is blooming in your garden at the moment. The purple tulips/oregano/J.Maple combination is a lovely blend. I love that chartreuse shade as a filler. 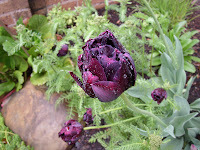 The Black Hero tulip looks lovely with the water droplets covering it. P.S. I meant to add that I agree with Karen and Ki about the light of an overcast day. It does saturate the colors. Works great!